On the 29th of the month, commemoration of the beheading of the honorable head of the holy, glorious Prophet, Forerunner and Baptist John. This great Forerunner of the Lord, according to the testimony of the Master Christ, was the greatest man to have ever been born of any woman, and the foremost of the Prophets. 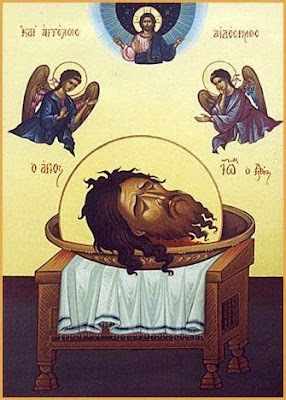 It was he who leaped for joy in the womb of his mother, and preached Christ to those people living on earth, and to the souls of the dead found in Hades. He was the son of Zachariah the High Priest and Elizabeth, having been born after it was announced by the Archangel Gabriel. He was beheaded today by Herod Antipas, because he rebuked him for his unlawful mingling with Herodias. It was this great John who was clothed in holiness in the womb of his mother. It was he who had virginity and purity inhabiting his soul, and wholeheartedly loved prudence. It was he who practiced fasting and non-eating, and set himself apart from all contact with people. It was he who dwelled in the desert, and had contact with the wild beasts, and was covered with the hair of a camel, and girded himself at the waist with a leather belt. It was he who had his food prepared and ready like the birds, and was made worthy to exceed the laws of nature, and to baptize the pure and immaculate Christ, Who is beyond all nature. For this reason such a great Saint, having always studied the Law of God, considered all things in the world as second and below to keeping this divine law. Herod the tetrarch of Judea, therefore, being very licentious and unbridled, took the wife of Philip his brother, at a time when his brother was still living, and who had a daughter with Herodias. Both of these things went against the divine Law. Wherefore the great Forerunner, moved by divinely inspired zeal, and armed with the weapons of truth, rebuked the licentious king: "It is not forgivable for you to have the wife of your brother." Herod was unable to bear this rebuke, so he bound the grace-filled John and put him in prison, at the influence of the unbridled adulterous Herodias. When the time came for the birthday of Herod to be celebrated with his rulers, there was put together a rich dining table, with drinking and delight, which plunged Herod into drunkenness and senselessness. Then the daughter of Herodias came, and danced before the king. To her was given a reward for her unseemly dance, the murder, alas! of the great Prophet. Straightway, therefore, there was brought into the midst of the dining room on a platter, the head of the Righteous Forerunner, still dripping with blood and silently rebuking Herod, and it was given to that unbridled and adulterous woman. These things took place in Sebaste, which is about a days journey from Jerusalem, where the ruler after Herod the tetrarch built his royal palace, and the aforesaid prophet-slayer held his drinking party. And there the all-honored and holy body of the great Prophet was buried by his disciples, and was reverently and honorably placed in his grave. 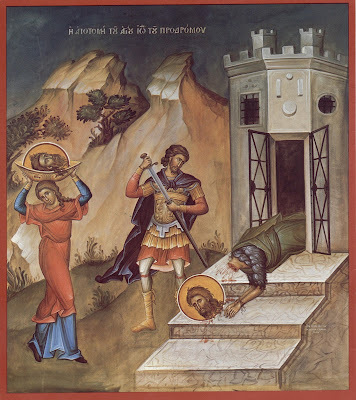 His synaxis is celebrated in his Prophetic Temple in the Sphorakia district of Constantinople. The just is remembered with praises, but for you the Lord’s testimony suffices, O Forerunner; for you were declared more praiseworthy than the Prophets, because you were found worthy to baptize in running streams the One they had proclaimed. Therefore, having struggled bravely for the truth with joy, you preached to those in Hades a God Who had appeared in flesh, Who takes away the sin of the world, and grants us His great mercy. 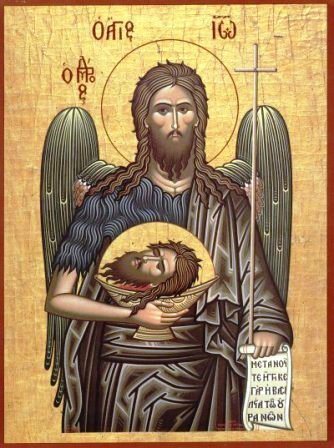 The glorious beheading of the Forerunner became a divine dispensation, that he might proclaim to those in Hades the coming of the Savior. So let Herodias grieve who asked for lawless murder, for she loved neither the law of God nor the age that lives, but one artificial and temporary.